County Galway (Irish: Contae na Gaillimhe) is a county in Ireland. It is located in the West of Ireland, part of the province of Connacht. There are several Irish-speaking areas in the west of the county. The traditional county includes, and is named for, the city of Galway, but the city and county now have separate local authorities: Galway City Council administers the urban area, while the rest of the county is administered by Galway County Council. The population of the county was 258,058 at the 2016 census. The county originally comprised several kingdoms and territories which predate the formation of the county. These kingdoms included Aidhne, Uí Maine, Maigh Seóla, Conmhaícne Mara, Soghain and Máenmaige. County Galway became an official entity around 1569 AD. The region known as Connemara retains a distinct identity within the county, though its boundaries are unclear, and so it may account for as much as one third, or as little as 20%, of the county. The county includes a number of inhabited islands, such as the Oileáin Árann (Aran Islands) and Inis Bó Fine (Inishbofin). Nearly 20% of the population of County Galway live in the Gaeltacht (Irish-speaking districts). County Galway is home to the largest Gaeltacht Irish-speaking region in Ireland. There are over 48,000 people living within this region, which extends from Galway city westwards through Connemara. 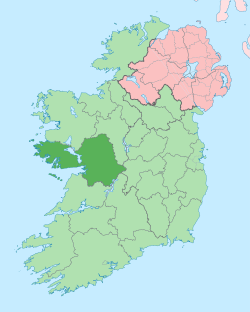 The region consists of the following Irish-speaking areas; Galway City Gaeltacht (parts of the city), Gaeltacht Cois Fharraige, Conamara Theas, Aran Islands and Duiche Sheoigheach (a part of the northern Galway region known as "Joyce Country" and Maam Valley). All schools within the Gaeltacht use the Irish language for classroom instruction. There is also a third-level constituent college of NUIG called Acadamh na hOllscolaíochta Gaeilge in Carraroe and Carna. Clifden is the largest town in the region. Galway City is also home to Ireland's only Irish-language theatre, Taibhdhearc na Gaillimhe. There is a strong Irish-language media presence in this area too, which boasts the radio station Raidió na Gaeltachta and Foinse newspaper in Carraroe and national TV station TG4 in Baile na hAbhann. The Aran Islands are also part of the Galway Gaeltacht. According to Census 2016, there were 84,249 people in County Galway who could speak Irish. According to Census 2011, the Galway city and county Gaeltacht has a population of 48,907, of which 30,978 say they can speak Irish, 23,788 can be classed as native Irish speakers while 7,190 speak Irish daily only within the classroom. There are 3,006 attending the ten Gaelscoil (Irish language primary schools) and three Gaelcholáiste (Irish language secondary schools) outside the Galway Gaeltacht. According to the Irish Census 2016 there are 9,445 people in the county who identify themselves as being daily Irish speakers outside the education system. Prior to the enactment of the Local Government Act 2001, the county was a unified whole for administrative purposes, despite the presence of two local authorities. Since that time, the administrative re-organisation has reduced the geographical extent of the county by the extent of the area under the jurisdiction of Galway City Council. Today, the geographic extent of the county is limited to the area under the jurisdiction of Galway County Council. Each local authority ranks equally as first level local administrative units of the NUTS 3 West Region for Eurostat purposes. There are 34 LAU 1 entities in the Republic of Ireland. The remit of Galway County Council includes some suburbs of the city not within the remit of Galway City Council. Both local authorities are responsible for certain local services such as sanitation, planning and development, libraries, the collection of motor taxation, local roads and social housing. The county is part of the Midlands–North-West constituency for the purposes of European elections. For elections to Dáil Éireann, the county is part of three constituencies: Galway East, Galway West and Roscommon–Galway. Together they return 11 deputies (TDs) to the Dáil. According to numbers published by Galway Chamber of Commerce in early 2019, there were then 196 information and communications technology (ICT) organisations in Galway, including IBM, SAP, Oracle and Cisco. There is a number of medical device companies in the area, including Medtronic (with approximately 1,800 employees) and Boston Scientific (2,800 employees). The Irish fast food chain Supermac's, which also operates Irish Papa John's Pizza restaurants, has its head office in the Ballybrit Business Park in Ballybrit, County Galway. Gaelic games are the most popular sport in the county. Galway had traditional regions in which Gaelic football or hurling is played. For example, in south and eastern County Galway, in places such as Portumna, Gort, Clarinbridge and Athenry, hurling is the dominant sport with successful teams at county and national level. Most of the rest of the county is considered to be footballing territory, with most of the county players being from Tuam, Oughterard or parts of Galway city. Galway United FC compete in the SSE Aitricity League of Ireland and plays home games in Eamonn Deacy Park. Connacht Rugby competes in the Pro14 is based in Galway city. The two main amateur rugby clubs in the county are Galway Corinthians RFC and Galwegians RFC which compete in the All-Ireland League. Athletics is also a very popular sport in Galway, a few clubs being; Galway City Harriers, Craughwell Athletic Club, Athenry A.C, Tuam A.C, Loughrea A.C and many others. ^ a b c "Census 2016 Sapmap Area: County Galway City". Central Statistics Office (Ireland). Retrieved 21 October 2018. ^ a b c "Census 2016 Sapmap Area: County Galway County". Central Statistics Office (Ireland). Retrieved 21 October 2018. ^ Mannion, Joseph (2012). "Elizabethan County Galway: The Origin and Evolution of an Administrative Unit of Tudor Local Government". Journal of the Galway Archaeological and Historical Society. 64: 64–89. JSTOR 24612855. ^ NISRA - Northern Ireland Statistics and Research Agency (c) 2013 Archived 17 February 2012 at the Wayback Machine. Nisranew.nisra.gov.uk (27 September 2010). Retrieved on 23 July 2013. ^ a b "Census of Population 2016 - Profile 10 Education, Skills and the Irish Language". Central Statistics Office. Retrieved 11 October 2018. ^ a b "Galway in Numbers". galwaychamber.com. Galway Chamber of Commerce. Archived from the original on 7 January 2019. "On the Corporation Books of Galway", Trench, W.F. & Lawson, T.D., Journal of the Galway Archaeological and Historical Society Vol. 1, 1900–1901, no. 2. "The Lurgan canoe", Costello, T.B, JGAHS Vol. 2, 1902, no. 1. Blake Family Records, vol. 1, Martin J. Blake. "Portrait of Sir Valentine Blake of Menlough, 3rd Baronet (1608–1652)", anon, JGAHS Vol. 3, 1903–1904, no. 3. "Will of Geoffrey French of Galway, A.D. 1528", Martin J. Blake, JGAHS Vol. 4, 1905 –1906, no. 4. "A De Burgo silver chalice, A.D. 1494: with notes on the family of Bourke of Turlough, Co. Mayo; drawing & text. "JGAHS Vol. 5, 1907–1908, no. 4. Old Galway", Maureen Donovan-O'Sullivan, 1942. "The Anglo-Normans in Co. Galway: the process of colonization", Patrick Holland, JGAHS Vol. 41, 1987-88. "Minor Famines and Relief in Galway, 1815-1925"
"From Connacht to North America: State Aided Emigration from County Galway in the 1880s"
"Trade Unionism in County Galway, 1898-1914"
"Scríobhaithe Lámhscribhínni Gaeilge I nGallimh"
"The Galway Gaeltacht, 1926-81: a Sociolinguistic Study of Continuity and Change"
A town tormented by the sea: Galway 1790-1914, John Cunningham, 2004. The Ploughman on the Pound Note, Eugene Duggan, 2004. Land and Revolution" - Nationalist Politics in the West of Ireland 1891 - 1921, Fergus Campbell, 2005. "The de Berminghams, Barons of Athenry", Paul Mohr, JGAHS Vol. 63, 2011. Clár Amhrán Mhaigh Cuilinn, Ciarán Ó Con Cheanainn, 2011. Loughrea, that den of infamy: The Land War in County Galway, 1879–82, Pat Finnegan, 2014. East Galway agrarian agitation and the burning of Ballydugan House, 1922, Anne O'Riordan, 2015. Rebellion in Galway - Easter Rising 1916 Kevin Jordan, 2016. The Tribes of Galway: 1124-1642, Adrian Martyn, 2016. He was Galway:Máirtín Mór McDonogh, 1860–1934, Jackie Uí Chionna, 2016. Wikimedia Commons has media related to County Galway. Wikivoyage has a travel guide for County Galway. Wikisource has the text of a 1906 New International Encyclopedia article about County Galway.